Ichthyosis is a family of genetic skin disorders that are characterized by dry, cracked and scaling skin. It is rare however, and many people don’t fully understand the disorder, which can lead to misinformation. The Foundation for Ichthyosis & Related Skin Types, Inc.(FIRST) has put together the following information to dispel any myths or misunderstandings that exist in an effort to better educate people about this disorder. Have a question about ichthyosis? Call toll-free at 1.800.545.3286 or visit www.firstskinfoundation.org. FACT: You cannot catch ichthyosis from another person. The disorder is not caused by bacteria, virus, or germs. It is caused by a genetic mutation. MYTH: People with ichthyosis often look very red because their skin is on fire and hurts all the time. Other people with ichthyosis need to clean themselves better because their skin is brown and dirty-looking. FACT: Ichthyosis is not the result of a bad sunburn or poor bathing habits. In some cases, the skin appears very red due to erythema, a medical symptom, but it does not hurt them. Other types of ichthyosis cause the skin to exfoliate in plates or clumps, and the scaling skin becomes brownish as it peels off. People with ichthyosis are not dirty or burned. MYTH: Ichthyosis is so rare, and we have no family history of it – so I really don’t need to worry about it at all. 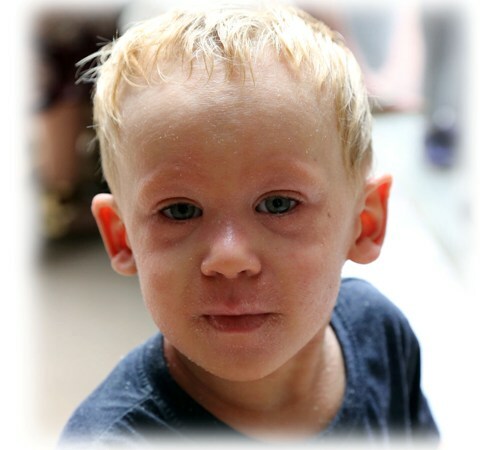 FACT: Each year, more than 16,000 babies are born with some form of ichthyosis. Ichthyosis is caused by a genetic defect called a mutation. Although typically mutations are inherited from family members, they can sometimes occur spontaneously. These mutations are present at birth, but in some cases symptoms do not become apparent until later in life. MYTH: People with ichthyosis usually don’t live long. FACT: People with ichthyosis lead normal, productive lives. In the past, babies diagnosed with Harlequin ichthyosis, the most severe form, rarely survived the first few days of life. However, with recent advances in neonatal care and the advancement of medical care, Harlequin infants do survive and lead fulfilling lives. In fact, several surviving children with Harlequin ichthyosis are now young adults. MYTH: People with ichthyosis usually have other medical issues and disabilities. FACT: Most people with ichthyosis lead normal lives. While there may be some difficulties related to the disorder–including itching and risk of infection, there is no correlation between mental ability and the disorder. The severity of their skin condition, however, can sometimes lead to psychological symptoms as individuals work to cope with the appearance of their skin and other problems associated with their type of ichthyosis. MYTH: Ichthyosis is a disorder where you have no sweat glands, so you’re always hot. MYTH: People with ichthyosis often have eye and ear problems, too. FACT: Not always. Remember, the majority of the cases are mild, and not severe enough to impair eyesight or hearing. However, tightening of the skin around the eyes may inhibit an individual’s ability to close eyelids which can cause drying of the eyes or potentially risk damage to the cornea. Additionally, in some cases, skin build up over the ears may occur which could impair hearing. For this reason, those affected with ichthyosis need to visit their physician regularly to keep the ear canal free from skin build up.